AJ Bombers at the Mayfair Collection. Rendering by Rinka Chung. An early version of the restaurant’s menu includes a hamburger, chicken sandwich, two chorizo-beef burgers, a soy chorizo burger, two types of hot dogs and a grilled cheese sandwich. In addition to conventional sandwich toppings, the menu also includes a variety of unusual toppings, such as chimichurri sauce, guacamole, salsa, charred pineapple and fried egg. On the dessert menu, four types of churros will be available. Ice cream will be available in scoops, cones, a cookie-ice cream sandwich and a specialty crunch cone with crumbled cookie, spiced Mexican chocolate and churro flecks. There are also a variety of shakes, fountain drinks and floats, including root beer floats, nitro coffee floats and orange and cream floats. Colectivo Keg Company Beer will be served from the tap. Casey describes the space, which was completely remodeled, as “a rustic and classy vintage jazz club” featuring chandeliers, exposed brick and warm tones. “It’s a really unique, beautiful space,” says Casey. Holey Moley Coffee + Doughnuts will be the first to launch, opening on Tuesday, Nov. 29 at 6:30 a.m. offering hot coffee and signature scratch-made doughnuts in a variety of styles, including cake, old fashioned, yeast, fritters and doughnut holes. Unlike its Third Ward location at 316 N. Milwaukee St., the West Side Holey Moley will offer options for both indoor and outdoor seating. Both AJ Bombers and Smoke Shack will open Thursday, Dec. 1 at 11 a.m. Smoke Shack will serve humanely raised dry-rubbed and smoked meats, house-made sides and creative cocktails in a rustic atmosphere featuring repurposed barnboard as an interior element. Beginning in the warmer months, the restaurant will also feature a seasonal patio and outdoor bar. Meanwhile, the new AJ Bombers will mimic a the playful environment of its Downtown location, featuring “p-nuts” and creatively customizable burgers, fries and signature custard. 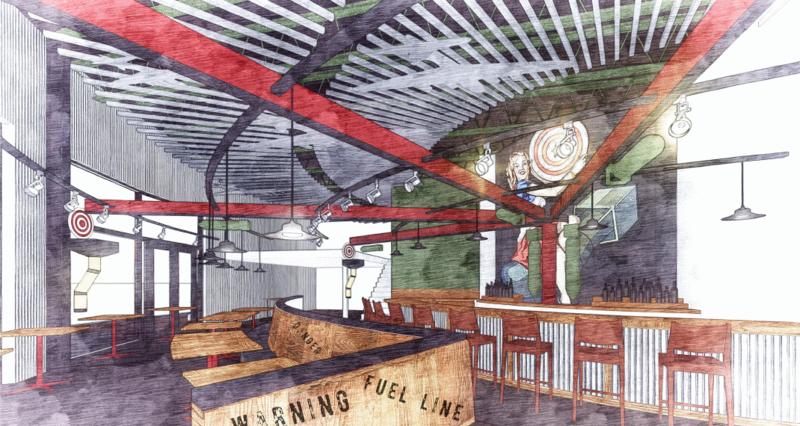 The restaurant, which features products from Stevens Point Brewery, will span approximately 15,000 square feet and offer access to the go-kart facility next door. Viewing windows will also be available in the dining area, offering up a birds eye view of the action. The menu will feature appetizers including fried cheese curds, chili cheese fries, mozzarella sticks and shrimp cocktail, along with a menu of burgers (including build-your-own), salads and entrees including a chicken pot pie, salmon and a Friday fish fry. There will also be ice cream floats, shakes and signature alcoholic milkshakes in flavors like frosted gingerbread, dreamsicle and campfire s’mores. Beginning Dec. 1, Point Burger Bar Pewaukee will be open daily from 10:30 a.m. to midnight. In the new year, the restaurant will add sushi on the weekends to fill a void in Cedarburg, Phoa said. New Fortune also will have some Korean and Thai dishes on the menu. The bar will have sake and six or seven Asian-inspired cocktails, Phoa said. Phoa was general manager at the previous New Fortune. “I learned the ins and outs of the whole process,” he said. The only reason the restaurant closed, he said, was because he wanted to go to college and live life — something that wasn’t possible in a family-run business that was open every day. A few years passed. “I started to realize I always loved the restaurant business,” Phoa said. The 54-seat restaurant will be open starting Nov. 21 from 11 a.m. to 9 p.m. Sunday to Thursday and 11 a.m. to 10 p.m. Friday and Saturday.